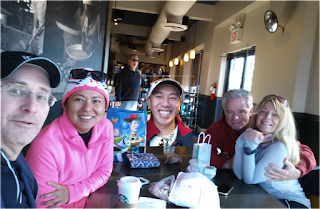 The Runsketeers got together today (at the Massapequa Preserve) for the first time since late November. We almost ended up at SUNY Old Westbury out of concern that yesterday's snow would make the trail unrunnable. SIOR, who is training for Boston in April, had a long run planned today and got to the Preserve early to gain miles before we arrived. She texted us that the trail was fine so we all met there at 9:00 AM. We had a complete crew today that included me, SIOR, KWL, TPP and JC. We were glad to see each other but quickly hustled onto the trail. There was a guy standing with his barking dog that SIOR said had been in that spot all morning. Better a dog on a leash than some of the other weirdness that goes on at the Preserve these days. I took it slow for two reasons. One because it was slippery. Two, because I'm slow. TPP and JC took off ahead of us, KWL eventually caught up with them and SIOR and I carefully made our way through the snow and ice covered sections. I'm still coming back from a couple of weeks where most of my aerobic activity consisted of coughing and not running. I'd run about 6.5 miles since Friday, but today's weather and trail conditions discouraged me from going more than 3.1 miles today. SIOR and I were able to chat easily through our out-and-back. We took refuge in her monster truck to stay warm until KWL joined us after completing 5+ miles. The three of us hung out until TPP and JC returned from their 7 mile journey. Unfortunately KWL needed to leave earlier than planned and couldn't join us for aprés run coffee. The four of us made our way to Starbucks and commandeered a long table where we exchanged holiday gifts. I think this counts as the Runsketeer holiday party. SIOR gave me two ways to keep my hands warm - an awesome pair of UA running gloves and two packet hand warmers. Both will be well used. TPP gave me a couple of Daily Burn CDs which will finally force me to pay attention to my upper body. The four of us talked a lot about running and TPP and I compared our PBs for 5K, 4 miles, 10K, and half marathons. She beat me by either a little (3 seconds on the 5K) or a lot (3+ minutes on the 10K). I wished I'd mentioned 8K, because I may have won that one since she probably hasn't raced that distance. We talked about endurance events and I asked JC what part of a triathlon is the hardest. He said none of it is hard. In fact he said an Iron Man is a piece of cake because you have 17 hours to finish. Actually he said SIOR could do it in less than a day and I could do it in a week. I wonder if I should be insulted by that. I always thought a week was more than 17 hours. Maybe triathlon math is different than regular math. We missed KWL, but I put him in the picture above. That was his picture from the last time the Runsketeers got together. This picture was the best of about five that I took today. SIOR was making faces in one (big surprise) and my phone distorted at the edges and made TPP (who is extremely fit) look like a candidate for the Biggest Loser. It was great getting to be with my buddies all morning. I'm excited that I'll get to see them again soon when we all go to see the movie Patriot's Day. Due to the icy roads, I'm probably going to stay inside and do my fourth weekend run on the treadmill tomorrow. If I'm feeling ambitious I will take a crack at the Daily Burn vids. I really hope we have a thaw this week so I can run outside and use my cool new running gloves on Friday. You need to get your listening ears adjusted. He said I would be ready to complete an Ironman in a day, and you might be ready in a week. Perhaps I need to adjust my fantasy ears because the chance of me being prepared to swim 2.4 miles, bike ride 112 miles and run a full marathon with one week's training is chimerical at best. His point was anyone can complete one. Just as I believe anyone can complete a marathon. The better prepared might be able to finish in less than 3 hours, while others may take 6. I believe JC was giving me far too much credit, although I do think I could complete a marathon in 17 hours.